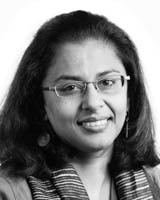 Associate Professor Leena Thomas is a sustainable architecture academic and research expert with experience in Australia and India. Her research focuses on interrogating and transforming contemporary design practices to be responsive to global concerns for climate change, zero carbon development and high-quality living/work environments. Leena has pioneered the use of detailed post-occupancy evaluation to develop a rich narrative of building performance that combines social and qualitative dimensions of building development and operation with technical building performance. Her research emphasises contextual analysis of design process, design attributes and building management in tandem with metrics for energy and occupant satisfaction, comfort, health, well-being, and perceived productivity. Leena’s studies in India and Australia include a number of iconic green buildings as well as a range of contexts from activity based working (ABW), high density living, retail and transient environments to public buildings. Funding partners and industry stakeholders have used her research outcomes to validate design decisions toward improving development and procurement of buildings, and to manage facilities better to ensure they reach their potential. At UTS, Leena teaches sustainable architectural design, thermal design, lighting, acoustics and advanced environmental control in buildings. Her recent Master of Architecture design studios at key brownfield sites explore the role of architecture as a catalyst for sustainability and regeneration in the city. Leena is currently Chief Investigator with Professor Richard de Dear on an Australia Research Council Linkage project Building Occupants Survey System Australia - LP110200328. She is also Lead Expert and CI on a project that has developed the India Model for Adaptive Thermal Comfort (IMAC) with CEPT University, Ahmedabad India, funded by the Ministry of New and Renewable Energy - Government of India, Climate Works Foundation and Shakti Sustainable Energy Foundation. She was the UTS Coordinator for a Developing Architectural Education in Response to Climate Change (DARC) project between six universities: ETSAB Barcelona, ENSA Toulouse, Politecnico di Torino and RMIT, UTS and QUT. This was a Joint Mobility Project under the EU-Australia Bilateral Cooperation Projects for Designing the New World programme between 2010 and 2013. Her expertise is recognised through invitations to provide policy advice for government and industry bodies, peer review of research work, and dissemination of research outcomes for its application to professional practice and to serve on design and industry award juries. AUDIO: Trains, cars and carbon - oh my! © 2018, © 2018 Informa UK Limited, trading as Taylor & Francis Group. Activity-based working (ABW) provides office workers with a variety of indoor workspaces purposively designed to accommodate different tasks. Despite an increased use of ABW, studies focusing on its impact and the resultant office design are yet to follow suit. This paper addresses this knowledge gap by providing empirical evidence from studies conducted before and after relocation from contemporary open-plan offices to ABW spaces. Results from post-occupancy evaluation (POE) surveys (n = 896 responses), spot measurements of indoor environmental quality (IEQ) and step-count monitoring (one case study; n = 20 participants) before and after relocation are reported. A total of 10 workspaces participated (six combi and four ABW) in this study. Design features were documented and analyzed. While there were limited differences in the measured IEQ conditions between office layouts investigated here, ABW workspaces yielded significantly higher satisfaction results on key IEQ dimensions, perceived productivity and health. Office layout was also found as a significant (or nearly significant) predictor of occupants' lightly active and sedentary time but did not affect occupants' daily step counts and distance they travelled. These results highlight the significance and impact of office layout and human-centred approach to design on occupants' satisfaction, perceived productivity and incidental physical activity opportunities. Methods: Our reflections draw on the findings of a recent review of existing health and planning literature. First, we explore the ways in which 'adaptation' and 'mitigation' relate to the notion of human and planetary health. We then outline the broad scope of adaptation and mitigation interventions being envisioned, and in some instances actioned, by built environment professionals. Research findings point to three methodological shortcomings of current post-occupancy evaluation (POE) tools: (1) contextualizing results, (2) adding instrumental data side by side to survey results and (3) producing meaningful feedback to its key stakeholders. This paper introduces the holistic BOSSA (Building Occupants Survey System Australia) and tools developed under this project's scope in close collaboration with industry. It aims to present and discuss the statistical analysis used in the BOSSA tool, distilling the survey results down to nine indoor environmental quality (IEQ) dimensions and their association with four overall indices. Principal component analysis (PCA) extracted nine IEQ dimensions that were uncorrelated with each other: spatial comfort, indoor air quality, personal control, noise distraction and privacy, connection to the outdoor environment, building image and maintenance, individual space, thermal comfort, and visual comfort. Four separate multiple regression analyses were conducted, one for each global evaluation item as an independent variable: work area comfort, building satisfaction, productivity and health. This statistical analysis provided the rational basis of BOSSA's scoring system, designed to simplify how occupant survey results are communicated to key stakeholders from the property industry and researchers. India is witnessing unprecedented growth trends in building construction, particularly office spaces. Indian offices are designed to operate at 22.5 ± 1 °C all year round to meet the stringent 'Class A' specifications outlined by international standards in the absence of an India-specific comfort standard. This paper proposes an India Model for Adaptive Comfort – IMAC – based on the field surveys administered in 16 buildings in three seasons and five cities, representative of five Indian climate zones. A total of 6330 responses were gathered from naturally ventilated, mixed mode and air-conditioned office buildings using instantaneous thermal comfort surveys. Occupants in naturally ventilated Indian offices were found to be more adaptive than the prevailing ASHRAE and EN models would suggest. According to the IMAC model, neutral temperature in naturally ventilated buildings varies from 19.6 to 28.5 °C for 30-day outdoor running mean air temperatures ranging from 12.5 to 31 °C. This is the first instance where a study proposes a single adaptive model for mixed mode buildings asserting its validity for both naturally ventilated and air-conditioned modes of operation in the building, with neutral temperature varying from 21.5 to 28.7 °C for 13–38.5 °C range of outdoor temperatures. For air-conditioned buildings, Fanger's static PMV model was found to consistently over-predict the sensation on the warmer side of the 7-point sensation scale. By combining the carbon impacts of commuting and building emission for the first time, the paper provides useful insights for designers and decision-makers. The authors investigate the greenhouse emissions of office workers in Sydney, drawing on census data, national building energy benchmarks as well as journey-to-work and energy data from two study buildings. Comparing work locations in the central business district (CBD) and Macquarie Park Corridor with metro-wide averages, they find that building emissions dominate over commuting emissions across the city, but commuting is increasingly important as building energy efficiency increases. Interestingly, the results indicate that efforts to improve a building's energy efficiency at Macquarie Park are largely negated by high reliance on car travel despite the introduction of the Epping–Chatswood train line. The authors conclude that improving building energy efficiency, office space utilisation and network connectivity (currently evident only in the CBD) delivers the best opportunity to reducing the carbon cost of workplaces. Proponents of energy efficiency and sustainability in the built environment have always understood the importance of the facade as a key element for a building to achieve these aims. In recent times the multiple roles played by the facade in providing natural light, enhancing visual amenity and improving thermal comfort has come to the fore. This is in no small measure due to improvements in technology being achieved at low costs. A number of international and local buildings have demonstrated the effectiveness of a facade to resolve aesthetic priorities against performance requirements. These buildings stand apart from others in part because of the level of detail in the resolution of the facade, and its integration with the other building systems. This book chapter develops the case for retrofitting existing buildings drawing on insights from the post occupancy evaluation of three office building refurbishments of varying scales. It argues for a strategic approach to building refurbishment that recognizing the nexus between indoor environmental quality, building performance and energy efficiency and occupant satisfaction and productivity. In response to concerns of climate change, the growing emphasis on sustainable architecture is matched by a plethora of regulatory codes and rating schemes that mandate or benchmark building environmental performance in many parts of the globe. In Australia, the Education and Sustaiuability Policies of the Australian Institute of Architects and accreditation processes of the Architects Accreditation Council of Australia (A..ACA) commit to implementing sustainable design practices across all its endeavours and reinforce the importance of this discipline area. Consequently, the inclusion of environmental studies and architectural science in some form or other within any architectural course has remained largely uncontested despite the pressure to curriculum content from an ever widening scope of professional architectural requirements. Nevertheless, a review of several papers on the pedagogical approaches and outcomes for environmental studies reveal consistent themes surrounding the compartmentalised approach to teaching these subjects in architectural courses, the desire to integrate environmental studies into studio teaching, and the need to make the discipline area more appealing to students (see AlA 2006, Rutherford 2006 and Loftness 2005). With growing concerns for enhancing sustainability, much attention has being paid to benchmarking performance in buildings. This paper evaluates the effectiveness of three rating systems that have been widely adopted for over a decade in Australia namely: (i) mandatory compliance under Section J (Energy Efficiency provisions) in the National Construction Code of Australia (NCC), (ii) a voluntary design rating tool - Green Star, and (iii) a voluntary operational rating tool-National Australian Building Environmental Rating Scheme (NABERS). The paper builds on the authors' experience in building performance simulation, rating tool design, practice consultancy and post occupancy evaluations of buildings. It presents a detailed analysis of the rating tools with respect to the alignment between what is being assessed, how it is assessed and administered and the impact on design process and performance outcomes in buildings. The paper assesses the successes and shortcomings of the rating tools to demonstrate the potential for design and post occupancy rating tools to influence market behaviour and building performance and argues for increasingly stringent approaches to get to net zero emissions. This paper proposes an alternate approach to considering the role of the architect against a backdrop of climate change, urban expansion and evolving technology, as the remit of architects is increasingly marginalized by other professions. Using the case study of architectural design studio investigations for the Master of Architecture at the University of Technology, Sydney on conflicted sites in Australia, the paper address the implications at two levels: 1. Opportunities where architecture and strategic urban interventions become catalysts for sustainable practices. 2. Insights and outcomes from this pedagogical approach to sustainable architectural design education. Developments on conflicted sites are laden with social, ethical, political and environmental concerns that intensify the environment and often contradict with sustainable development and intelligent environmental performance. The design studios explored in this paper challenge the traditional approach (in both academia and practice) of considering efficiency or technical building environmental performance in isolation. They offer opportunities for deploying design thinking in a strategic manner to develop resilient architecture in the context of climate change and current debates. This paper addresses the challenge of evaluating for natural ventilation in modern apartment buildings. A number of natural ventilation design rules of thumb from published literature are listed. Their incorporation into one code for Australia (the Residential Flat Design Code, or RFDC) and India (the National Building Code, or NBC), in relation to apartment buildings is examined. Practical limitations to converting these rules of thumb into effective natural ventilation systems for apartment building designs are discussed. Apartment designs in the moderate locations of Sydney, Australia and Bengaluru, India are also reviewed to assess their effectiveness for natural ventilation. Simulation analysis presented indicate large energy savings are possible if apartments are retrofitted/designed to the proposed code requirements and designs compliant with thumb rules are capable of delivering effective natural ventilation if users choose to operate the apartment in 'free running mode' during times when the outside dry bulb temperatures lie in an appropriate band. The paper also discusses how sub-optimal design solutions, affluence and adaptation to more stringent thermal conditions can negate the potential for natural ventilation and calls for proactive efforts to maintain climate responsive design standards and education/policy to encourage the benefits of natural ventilation over airconditioning. Before India's building sector can fulfil its CO2 abatement potential, it is imperative for new build projects, especially those which provide for commercial and public functions, to eschew the energy-intensive designs that characterized western commercial buildings of the 20th century. In the absence of an adaptive thermal comfort standard specifically for India's climatic and cultural context, the current trend is simply to design air- conditioned buildings to meet the stringent ASHRAE and ISO 'Class A' comfort specifications. This paper proposes a holistic Post Occupancy Evaluation (POE) study of a cross section of Indian office buildings purposively stratified across a range of energy intensities with diverse environmental control systems and design approach in different climatic zones to develop an adaptive thermal comfort standard. By climatically adapting indoor design temperatures, the standard will offer India a low-carbon development pathway for its commercial building sector without compromising overall comfort or productivity. Notwithstanding the immense potential to minimise a building's carbon footprint, there is a very low uptake of mixed mode systems. This paper addresses issues concerning mixed mode buildings in Australian climates that vary from mild to warm/hot climates. The paper documents issues and barriers to the proper functioning of mixed mode buildings based on projects that the authors have reviewed, surveyed or consulted upon. The impact of rating tools and guidelines, limitations in performance prediction, operational issues in practice and insights from post occupancy feedback are discussed from the perspective of mixed mode buildings. Delivering mixed mode buildings via the current commercial processes increases the risk of the design intent not being carried through to completion. The paper identifies a need for comfort guidelines explicitly developed for mixed mode building in contrast to prevailing frameworks for air-conditioned buildings and offers strategies for rethinking comfort, simulation, implementation and operation of mixed mode buildings. This paper presents lessons for futu re buildings that can be learnt from a Post Occupancy Evaluation (POE) of the Stockland Head Office in Sydney. Designed to improve energy efficiency and workplace quality, the large scale ref urbishment within an existing building is noteworthy in the current climate where approx imately 98% of buildings are older stock that would require refurbishment at some point in the f uture. The study incorpo rales the Building Use Studies (BUS) methodology (to evaluate occupant satisfaction with the work environment and identifies factors that influence user experience in the context of design process and interventions. ongoing building management and building environmental performance. The results from the BUS survey are remarkably good with ....... the overall Summary Index in the top decile of the Australian building data set and top quartile of the International dataset. Outcomes of the study highlight the importance of increased fres h air, daylight, glare control, access to views, noise management and low volatile organic compound (VOC) finishes towards improving indoor environmental quality f or occupants. The positive results in terms of energy consumption and occupant feedback seen here reinforce the value of an integrated approach to building design, development and management that is responsive to user needs. Thomas, L.E. 2008, 'Post occupancy evaluations - Insights for the next generation of green buildings', Sydney. The implementation of ecologically sustainable design (ESD) is relatively low in the Australian building market, despite the availability of technical information and rating tools. A detailed case study of the architectural design process and building performance is undertaken to analyse how decisions are made for ESD and what strategies work best. The study findings highlight the importance of client commitment and awareness regarding ESD, a carefully considered briefing and design team selection process accompanied by tangible environmental criteria, and an integrated design approach that is cognisant of user needs. Further, post occupancy evaluation of the building demonstrates the importance of extending the integrated approach to responsive management of the building during its occupancy to ensure successful realisation of ESD objectives. Thomas, L.E. 2000, 'A Study of an Energy Consumption Index Normalised for Area in House Energy Rating Schemes', 38th Annual Conference of the Australian and New Zealand Solar Energy Society, N/A, N/A, pp. 0-0. Thomas, L.E. accessUTS 2013, Towards High Performance Buildings ASSESSMENT OF VARIABLES INFLUENCING PERCEIVED PRODUCTIVITY For MACQUARIE BANK TENANCIES, pp. 1-12, Sydney. Thomas, L.E. University of Technology, Sydney 2012, Occupant's experience in retail shopping centres: Contract Research Project for Stockland Pty Ltd, Final Report - Post occupancy evaluation of Stockland Wetherill Park, Stockland Balgowlah and Stockland Merrylands, pp. 1-39, Sydney. In a first for retail centres, this contract research project was undertaken to develop a post occupancy evaluation methodology for shoppers and retailers and assess three shopping centres for the Industry Partner. The insights from this study contribute to the formulation of strategies for the development and ongoing management of retail centres to enhance user experience and indoor environmental quality. The study has also served to elicit useful information about shopper and retailer preferences, their attitudes and behaviour with respect to environmental concerns ranging from energy efficiency to transport. In this respect, it points towards the opportunity for a more holistic post occupancy evaluation of urban precincts and community projects that are of increasing interest to Stockland. Thomas, L.E. & Leaman, A. accessUTS Pty Ltd 2012, Occupants' Experiences at Macquarie Bank Tenancies, Stage 3: Variables influencing perceived productivity, pp. 1-39, Sydney. Thomas, L.E. accessUTS 2011, Evaluation of Occupants' Experience at Macquarie Bank Tenancies Stage 2: Post Occupancy Study at One Shelley Street, pp. 1-58, Sydney. This report provides the results for the evaluation of occupants' experience undertaken as part of the post occupancy studies in Stage 2 of an independent study to better understand the relationships between green building, indoor environmental quality, occupant perception and satisfaction with workplace and their worker productivity. The study draws on a multi methodological approach of occupant survey, focus groups site visits, and interviews with key stakeholders, and incorporated the Building Use Studies (BUS) survey that has been used to evaluate over 500 buildings in 17 countries including over 95 buildings in Australia. The study separately analysed the results for three cohorts based on their mode of working and location prior to move. The scale and scope of the study is unprecedented. In terms of occupants targeted, the study encompassed over 2600 at pre-occupancy phase to more 2800 employees in the post occupancy phase across the 3 study groups. A detailed comparative analysis of pre and post occupancy performance of the three study groups with respect to Australian and International benchmarks, key findings and implications for office design is provided in the report and accompanying appendices. The study results demonstrate a positive user experience at Shelley Street. All the three groups of building occupants studied returned positive results for user experience of overall air quality, air freshness and overall comfort, accompanied by an increase in perceived health and perceived productivity at Shelley Street in comparison to their previous locations. Thomas, L.E. UTS 2011, Occupants' experience in retail shopping centres, pp. 1-80, Sydney. Vandenberg, M. & Thomas, L.E. 2009, Post Occupancy Evaluation - Site Summary Report GreenHouse Level 15 179 Elizabeth St. Sydney, pp. 1-14. Post Occupancy Evaluation review of Green Building Council of Australia Headquarters (GreenHouse) and its occupants at 179 Elizabeth Street. The objectives of the review were to; measure how staff perceived their working environment including satisfaction of the current facilities; compare the responses to the Pre-Occupancy Evaluation conducted by the authors in the previous year; and to benchmark this building against the Australian dataset. Thomas, L.E. accessUTS 2009, Evaluation of Occupants' Experience at Macquarie Bank Tenancies Stage 1: Pre Occupancy Study at 20 Bond Street and 135 King Street, pp. 1-43, Sydney. An independent study to better understand the relationships between green building, indoor environmental quality, occupant perception and satisfaction with workplace and their worker productivity is undertaken over two stages: Stage 1: Pre Occupancy reviews to establish the benchmarking at current premises of Macquarie Bank at 20 Bond Street and 135 King Street. Stage 2: Post Occupancy assessment will occur about one year after occupancy (or at a time or times as considered appropriate by the clients) at One Shelley Street. This report provides the results for the evaluation of occupants' experience (incorporating the Building Use Studies Survey and Focus Groups) undertaken as part of the pre occupancy studies in Stage 1. The study separately analysed the results for three cohorts based on their mode of working and location prior to move. In addition to the planned assessment of the performance of the newly acquired premises, and its comparison to Australian benchmarks (Stage 2), the results of Stage 1 presented here provide a valid set of internal benchmarks against which the user experience of the new premises at One Shelley Street can be compared. Leaman, A., Thomas, L.E. & Vandenberg, M. Building Use Studies Ltd 2008, Occupant survey of CH2, pp. 1-23. Thomas, L.E. & Vandenberg, M. 2008, Pre and Post Occupancy Evaluation Green Building Council of Australia Head Office Stage 1: Level 4 249 Pitt Street Sydney, pp. 1-9. 9 page report in addition to appendices A pre-occupancy evaluation of the Green Building Council of Australia (GBCA) tenancy at Level 4 249 Pitt Street Sydney was undertaken as part of a Pre and Post Occupancy Evaluation Study for the GBCA. This report provides the summary findings of the first stage of this study and outlines the results of user experience of the Pitt Street tenancy. Thomas, L.E. accessUTS 2008, Pre and Post Occupancy Evaluation of Stockland Head Office: Levels 2 & 22-29, 133 Castlereagh Street, Sydney, pp. 1-30, Sydney. This report summarises the outcomes of field research to develop a narrative of building performance through the contextual analysis of design attributes and building management in tandem with metrics for energy and occupant satisfaction for the Stockland Head Office. Vandenberg, M., Thomas, L.E. & Leaman, A. Encompass Sustainability 2007, Post Occupancy Evaluation: CH2- Site Summary Report, pp. 1-15, Melbourne. Thomas, L.E. accessUTS 2006, Pre and Post Occupancy Evaluation of the Stockland Headquarters Tenancy, 157 Liverpool St - Stage 1, pp. 1-11, Sydney. An evaluation of occupant experience using the Building Use Studies survey was undertaken for Stockland Headquarters tenancy at 157 Liverpool Street. The study comprises the first stage of the pre and post occupancy evaluation being undertaken as part of the relocation of Stockland Headquarters to its new premises at Stockhome, Castlereagh St. The main purpose of this stage of the study is to provide an internal benchmark for comparison once the new tenancy is commissioned and occupied. Thomas, L.E. & Tarlo, K. Institute of Sustainable Futures 2002, SCOPING STUDY FOR TEMPLATE AND TRAINING PACKAGE DEVELOPMENT FOR HOME ENERGY AUDIT, pp. 1-39, Sydney.